I am a believer in such things as the UNESCO World Heritage List of sites in the world that should be protected as part of our global cultural heritage. A number of places in Italy are on the list, including the historic center of Naples. Lesser known is UNESCO’s more recent ICH (Intangible Cultural Heritage) list of the oral traditions and performing arts, some of which are on the verge of dying out. Some Italian items on that list are the Sardinian pastoral song form known as cantu a tenore, the Spire floats of Nola, and the Mediterranean Diet. Now, I notice an organization called the World Monuments Fund, self-described as the "leading private organization dedicated to saving the world’s most treasured places." That's fine with me. One Italian item on the list is not too far from Naples, the "ghost town" of Craco (photo, above) near Matera, about 25 miles inland from the coast along the sole of the Italian "boot." Craco shows up on other lists of ghost towns in the world, many of them quite recent (for example, Prypiat, near Chernobyl in the Ukraine, abandoned in 1986 after the disaster), places that have been abandoned by their inhabitants for one reason or other, a phenomenon that continues to fascinate us for one reason or other. The first historic settlements at Craco are from the early first-century b.c. and, like elsewhere in southern Italy, are Greek. The settlers may have been from an earlier coastal site at Metaponte, part of the expansion of so-called Magna Grecia; according to some, the site may even have been an earlier Mycenaean settlement. Make it, give or take a bit, 1000-700 b.c. In any event, it was off the beaten track even during the Roman Empire. By name, it is first mentioned as Graculum (a small area under cultivation) in 1060 and it did enjoy a strategic vantage point dominating the Cavone valley, important to Frederick II's defensive network in the south in the 1200s. The population reached 2,600 by 1561. In 1630, Craco established a permanent monastic order with the construction of the Monastery of St. Peter. The monastery influenced the local economy through the production of grains, vegetables, wine, and oil. Craco was a bulwark of revolutionary sympathies in the short-lived Neapolitan Republic of 1799, but was eventually suppressed by the Loyalist troops of Cardinal Ruffo. At the time of the unification of Italy (1861), Craco had 2,000 inhabitants. That number was cut in half during the mass emigrations to America in the decades before WWI. Population rose somewhat under Fascism (1920s & 30s), and, indeed, continued to approach 2000 by 1961. In 1963, a serious earthslide caused the town to be abandoned and the inhabitants resettled elsewhere. And there it sits, an empty reminder of part of the history of southern Italy. You can visit, if you like that sort of thing. Some film directors seem to, and Craco has cropped up in a few scenes from films as diverse as Mel Gibson's Passion of the Christ (2004) and the umpteenth James Bond film, A Quantum of Solace (2008). Of spirits passing through the streets..."
I don't mean that kind of ghost town, or there would be no end. I do note with interest, however, that many sites of antiquity in Italy have survived the centuries, some incredibly violent ones, without being abandoned. Naples, for one. Or they have survived after a brief fling with obscurity and abandonment (Rome in the 1300s) only to come roaring back to life. I mean sites that only a century of two ago were lived in and for some reason were deserted. 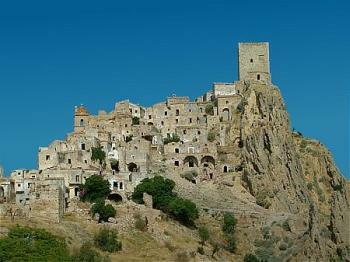 As noted above in part 1, Craco is not the only ghost town in southern Italy; also, as noted, it died out as a result of massive emigration from the area, one that was severely depressed economically. That was typical of a number of areas in Italy (and not just in the south), areas with large numbers of people who simply got up and left because there was no work to be found at home and no money to be made. They are the folks who made up the so-called "Italian diaspora" and populated the many "Little Italies" in other parts of the world. Many factors other than economics can cause a town to be abandoned: rivers can shift and leave you high and dry or be damned and drown your village; seacoasts can change; new roads and railways can decide to by-pass you and not stop there anymore, wars and massacres can destroy your town, etc. A common factor in many parts of the world, including southern Italy, is that of natural disasters such as earthquakes, floods, and hurricanes. In that case, you start looking for towns that might have the qualifier nuovo (new) in the name. Craco is in the province of Matera in the region of Basilicata, but if you move down 265 km/165 miles towards the very toe of the boot, just before you kick the island of Sicily, you find two such "new" and "old" towns in the Aspromonte mountain range in the province of Reggio Calabria in the region of Calabria: Roghudi and Africo. In the case of Roghudi Vecchio (pictured, above right), they built a new town 40 km distant after flooding made the old town, located at the foot of the mountains, uninhabitable in 1973. Roghudi Nuovo was built down on the Ionian coast, as was Africo Nuovo, when the old Africo was abandoned because of flooding in 1951. There are a number of these along the southern coast. The old buildings are still up there and crumbling away as ghost towns, no doubt serving as a strange kind of tourist attraction within the Aspromonte National Park. Earthquakes and war can play a major part in causing a town to pick up and move. That has happened relatively recently in the Campania region, of which Naples is the capital. 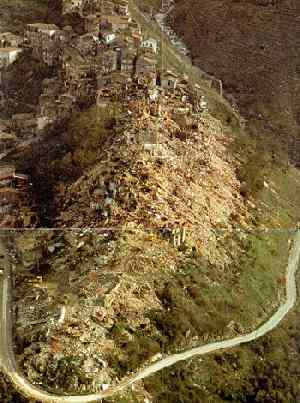 The Hirpinia quake of 1980 is an example: the town of Conza della Campania simply crumbled off its mountain perch (pictured, right) and was rebuilt elsewhere further down. Other nearby examples: one, a bit further north just below Monte Cassino, is from quite another cause: WWII—San Pietro Infine (the "old" one is pictured, left). (See this link; John Huston even made a movie about it: The Battle of San Pietro - 1945) Another, almost random, example (because there are so many) in Campania is in the province of Salerno: Roscigno Vecchia, where the population was ordered to evacuate in 1902 because the earth slides were so dangerous that locals had nicknamed their town "the town that walks"; thus they moved away and built Roscigno Nuova. Much closer to home, Naples, is New Pozzuoli, built a few miles away from the beach town of (old) Pozzuoli in the 1970s when seismic activities caused the population and civil authorities to panic. People moved out, the new town went up, the earth tremors ceased (at least for now), and everybody moved back home. The original Pozzuoli is back in high gear. Perhaps that is one of the few cases of fortuitous co-existence of a new town and its resurrected ghost town.